In the current issue of Valparaiso Poetry Review (Spring/Summer 2010: Volume XI, Number 2) Hila Ratzabi reviews Li-Young Lee’s latest collection of poetry, Behind My Eyes. Dialogue between lovers dramatizes the constraints of speaking. A “he said/she said” motif drives many of the poems, deeply embedded in a Lacanian framework, in which gender difference symbolizes the tension between (male) speech and (female) speechlessness. “Sweet Peace in Time” enacts this difficultly. The male, obsessed with language’s precariousness, continually asks the female: “What if by … you mean … but I mean …” The dialogue reads like two simultaneous monologues in which the lovers talk at each other, unable to find a common language. The male does not trust language, stating: “To speak is to err. / Words name nothing. / There are no words,” and later, “We should give up / trying to speak or to be understood. / It’s too late in the world for dialogue.” Yet the female never questions language; she declares faithfully: “Home, speech is the living purchase / of our nights and days.” Speech, to her, relates to home and time—to being at peace with the physical world. The male, on the other hand, emphasizes the instability of speech. It reminds him of the power of death, characterized as a muting force: “Death creates a blind spot,” i.e., death instigates a temporary forgetting which negates the requirement to speak and muffles the voice that in life is bound to the body. Only in death will the man be freed from having to speak. Then, in the most Lacanian formulation in the book, the male states: “Man is a secret, blind to himself. / And Woman … Woman is …” The man associates Woman with pure being; this explains why she has no need, like the man does, to question language. She speaks out of true self-knowledge of her physicality; while the man, “blind to himself,” can never get past his awareness of death, and consequentially, focuses on the faultiness of speech. 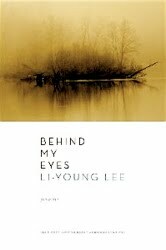 Enamored with the lure of language—its tease of meaning—the speaker in Lee’s poems sees language everywhere. This rapture with words figures most prominently in “Lake Effect,” where nature is equated with language. The “he said/she said” refrain from earlier poems morphs into the more personal “She said/I said.” The male and female speakers pile on metaphors: “She said ‘The lake is like an open book, / day like the steady gaze of a reader.’ // I said, ‘The day is a book we open between us, / the lake a sentence we read together …’ ” The male flips the female’s metaphors (transferring “book” from “lake” to “day”), extending and unfolding meaning. “Book” later becomes “voice,” and “The lake keeps changing its mind” (the lake a stand-in for the speaker). This changing mind ripples throughout the poem like shifting light on water: everything is a potential metaphor for something else; meaning is never stable. The tenuousness of communication embodied by male/female dialogue also comes into play in Lee’s depiction of mother/father figures. His formulation of an origin myth underlies his conception of the human being’s place in the world. Central to Lee’s personal genesis story, his portrayal of mother/father archetypes picks up on a trope from his previous collection, Book of My Nights (2001). The parental figures in Book of My Nights take on primordial significance, and they reappear in Behind My Eyes as part of a group of thickly layered symbols and metaphors of the speaker’s inner life. Like the male/female lovers, the parents signify a breakdown in meaning . . .
A very fine review of a poet whose work I began reading, with great admiration, last year. Thank you.